Is it appropriate, as a design professional, for one to create a design that meets only the minimum requirements of building codes and guidelines? Please join us for this 1-1/2 hour presentation to discuss the legal, ethical and professional responsibility, licensed architects should take in project planning and design. Gilda Puente-Peters, R.A., OWA, and Principal, Gilda Puente-Peters, Architects, Universal Design Specialists with Richard Skaff, Deputy Director, San Francisco Mayor's Office on Disability, retired, will present project design concepts that will provide you not only those basic concepts necessary to meet state and federal access codes and regulations, but also provide you with concepts that go beyond those minimum standards, including the philosophy of Universal Design. Architects and design professionals must consider approaching design from a different perspective than we have in the past. Our past practice has been to design a project and fit in the design needs of the disability community without really creating environments that are useable by everyone. Universal design takes an inclusive and broader approach – creating a built-environment that serves all users. There will also be a discussion regarding accessibility common design errors, construction tolerances and best practices. An update of the status of the State Access Specialist Certification program will be provided. Hafele is a worldwide manufacturer and distributor of cabinet, furniture and architectural builders hardware. They have a reputation for innovation and quality in offering products to increase efficiency of space while respecting design. Their products range from handles and knobs, kitchen and closet organization, to sliding doors and moving wall systems, as well as many other items in between. The Hafele San Francisco Showroom has been open since February of 1998. They are located in the heart of the San Francisco Design district. They cater primarily to design professionals, architects, interior designers, and building contractors. Though the company sells wholesale only to the trade, they welcome the general public to view our design solutions and a "European" perspective on hardware and organizational products. The Hafele San Francisco Showroom hosts many different events throughout the year that of are interest to design professionals, from valuable educational events where CEU's are offered at no cost to the attendees, to fun and promotional events like learning how to prepare Sushi from a professional. Their goal is to be of service to the design community by offering new ideas and solutions to common and difficult design issues. We hope that you'll take some time to explore the new features we've created, and we look forward to your participation and feedback as we continue to grow and expand what we offer our members. These are just the first steps we're taking to provide you with more valuable content. Over time, we'll be adding more exciting new features and functionality (e.g., photo galleries, discussion forums), so keep coming back! If you're already an OWA member with an email address on file, you're already signed up!! You should have received an email with your username (email address) and temporary password. If you received the notification email, just go to the site and log in using the information provided. If you didn't receive a notification email, but are already an active OWA member, please contact us immediately at webmaster@owa-usa.org and we'll get your account set up properly. Either we have an incorrect email address, or you don't have an email address on file with us. The new OWA Web site now contains members-only content that can be accessed by logging in to your registered OWA account. Once you've logged in, you'll have access to your profile and all other members-only information. The information stored in your OWA profile is how we keep you informed of OWA events and activities, and how we keep track of your membership dues. It's also now something that other members can see if you choose. At present, you can share contact information and professional interests; in the future, we may expand this to include things like photos or other things of professional interest to our members. You have the power to keep your profile up to date with our new site. When you log in, your profile becomes your OWA home page. From this page, just click the 'Edit profile' link, and you can edit your professional and personal information, as well as your preferences for things like profile visibility and OWA program participation. The member directory is a new, quick, convenient way to locate other OWA members. You can browse the directory by first or last name, or search by name, company, profession, or interests. You can also choose whether or not your profile information is visible to other OWA members or not within your profile; we respect your privacy and will keep your information confidential if that's your preference. 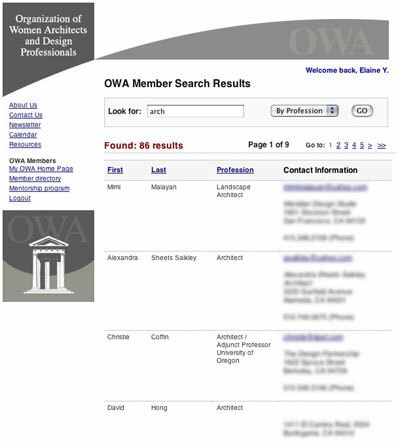 At present, the OWA member directory is not open to the public; only registered OWA members can view the directory. We want to make sure our site meets your needs as much as possible. If you have questions, suggestions for improvement, bug reports, or any other technical support issues, please contact us at webmaster@owa-usa.org. Please note that member information is being provided as a courtesy and benefit to all members. The list of information is meant for personal, not commercial use. We request that it not be given out to other organizations or used for advertising or spam. Thank you for your ongoing support of OWA! Your participation makes all the difference! 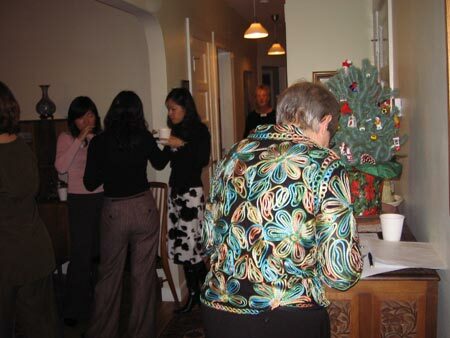 The OWA Holiday Benefit Party was a big success and drew numerous participants. 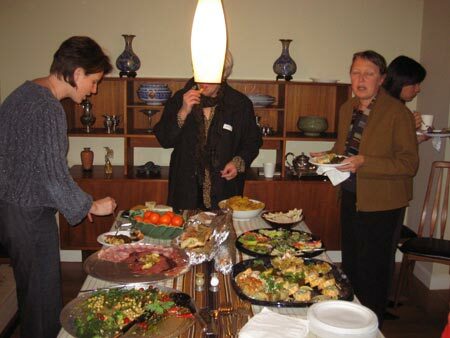 The event this year was catered at the newly renovated North Beach home of steering committee member, Mimi Malayan. Many donated gifts for the Hamilton House Center were collected and the left over food was delivered to a homeless support center, North Beach Citizens. It's wonderful to see so many interested members having a good time and helping their community. Thanks to Mimi for making the deliveries. She said she felt a little like Santa! On behalf of the families we serve at Hamilton Family Center, thank you for taking part in our holiday gift drive. Your thoughtfulness during the season of giving brightened the lives of homeless families and children in crisis and offered hope for the future. Hamilton Family Center just finished an extremely successful holiday season. Each of our five programs hosted holiday parties in which families celebrated the season with delicious holiday meals, festive music, and fun seasonal activities. I am especially pleased to let you know that, because of the overwhelming response we received from your group, and other members of the Bay Area community, all the families in our programs were "adopted" for the holidays and received gifts! Once again, we are grateful that you joined with Hamilton Family Center to support homeless families as they strive to make changes in their lives and achieve independence and self-sufficiency. Happy New Year to you all! The Organization of Women Architects and Design Professionals is pleased to announce the OWA Mentorship Program. 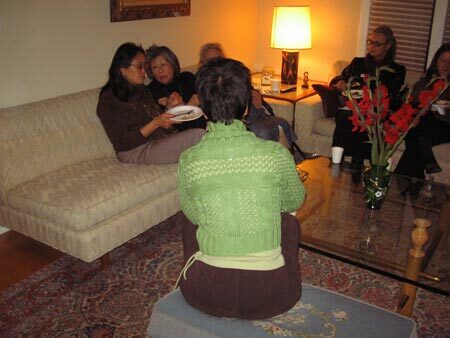 This program is designed to help members take advantage of the wonderful diversity that is present within our group, from the unique perspective of being women design professionals. Interested members will be asked to fill out a short questionnaire which establishes some key points that will be used to match mentors and "mentees". A database will be created which mentees may browse and search through in order to determine a match with the help of the Mentorship Program Coordinator. Any member may choose to be a mentor as well as a mentee at any time. If you want to be either a mentor or a mentee, please go to the website to enroll. There you will find detailed instructions and further information. Currently the program is still being developed, but members are encouraged to sign up in order to initiate the process. Thank you for your interest! We feel this will be a very rewarding part of the OWA membership experience. As two additional members of the steering committee, Mimi and Hana, will soon be stepping down we are actively recruiting for an additional member. If you or someone you know of would be interested in helping plan and coordinate the OWA, please contact any of the listed steering committee members below. 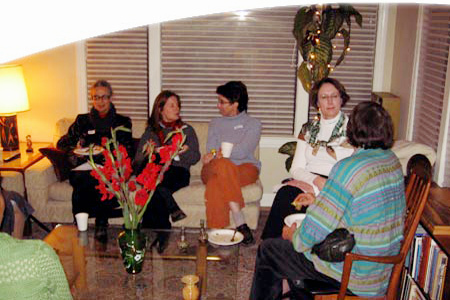 In addition, to the bi-monthly organization meetings, members meet every other month to plan and discuss OWA events, organization and future directions. For your participation in the OWA meetings, we request a $3 donation from members and a $5 donation for non-members unless otherwise noted on the calendar.